I thought things would change when I found the others. We would stop running. We would fight the Mogadorians. And we would win. The Fall of Five is the heartstopping fourth installment in the Lorien Legacies series by Pittacus Lore. But I was wrong. Even though we have come together, we barely escaped from them with our lives. And now we're in hiding, figuring out our next move. The six of us are powerful - but not strong enough to take on their entire army. We haven't discovered the full extent of our Legacies. We haven't learned to work together. Time is running out, and there's only one thing we know for certain: We need to find Number Five before they do. I am Number Four. I was supposed to be next. This battle is far from over. The first book in Pittacus Lore's Lorien Legacies series, I Am Number Four, is now a major Disney motion picture, and along with The Power of Six and The Rise of Nine, perfect for fans of The Hunger Games. %%%The Fall of Five is the heartstopping fourth installment in the Lorien Legacies series by Pittacus Lore. Pittacus Lore is Lorien's ruling elder. He has been on Earth for the last twelve years preparing for the war that will decide Earth's fate. His whereabouts are unknown. The first book in his Lorien Legacies series, I Am Number Four, is now a major Disney motion picture, and along with The Power of Six and The Rise of Nine, perfect for fans of The Hunger Games. 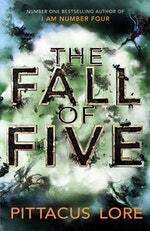 Love Fall Of Five? Subscribe to Read More to find out about similar books.